Welcome! If you like this post, please subscribe to the Coffee Muffins RSS feed. I hope you all had a wonderful Christmas, I am still spending some time with my parents. This however means that more new posts might be thin on the ground for a little while – I haven’t done any cooking or baking in 5 days! This is a soup I made just before Christmas and it was wonderfully tasty, and so simple. As with lots of good things it came from the necessity to use up things I had to hand and from no specific recipe. The week before Christmas, for me, is a time to try to use up anything left in the fridge or from the veggie box. I still had a plentiful supply of the soup basics: onions, leeks and carrots. 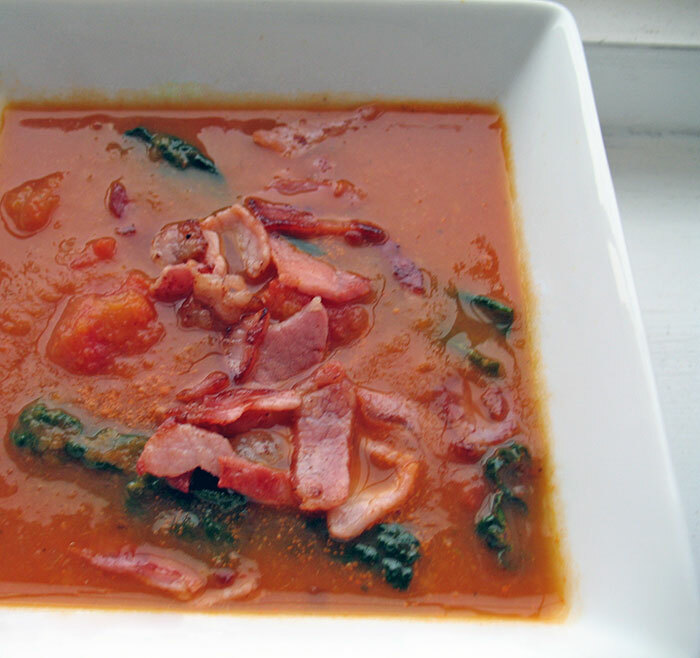 Add to this fresh black kale, a tin of tomatoes and some leftover crispy bacon, and you have the makings of the perfect winter warmer. First add a little olive oil to a pan over a medium heat, once warmed add the onion, carrots, parsnip and shredded leeks. Cook until softened around 10 minutes, before adding stock and leaving to simmer, with the lid on, for around 30 – 40 minutes. After all the vegetables are softened, blend the mixture, using a hand blender. Be careful as it will be hot! I like my soup still with the odd chunk of vegetables so I am not to precious about this step! Once blended put it back on a lower heat, adding the tin of tomatoes and the kale. Cook for another 20 minutes with the lid on then serve, topped with bacon. I make a huge amount of soup these days but very few recipes I feel are actually worth posting, either because they are not very good or because they are not very interesting. This one is neither, I love the fact that I finally have a great kale recipe and that the other half won’t turn his nose up at it.